Bernard Koku Avle, a Broadcast Journalist with a passion for telling the African story has been adjudged as the Ghana Journalist of the Year 2017. Bernard Avle hosts one of the popular radio shows in Ghana, “The Citi Breakfast Show,” on Accra based Citi FM. He is also the Director of News Programming at Citi FM. 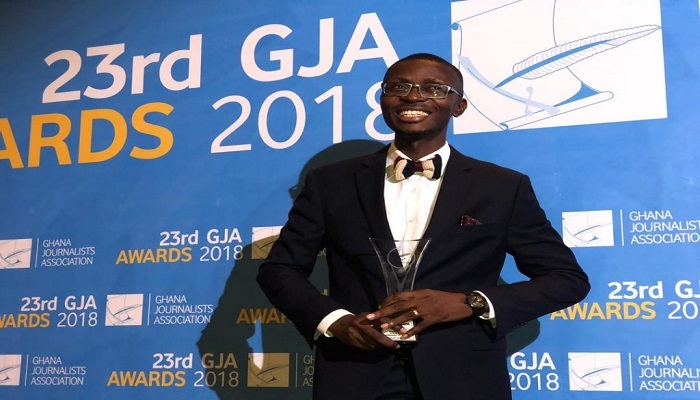 The 37-year old was presented with the 2017 PAV Journalist of the Year award at a ceremony organised by the Ghana Journalists Association (GJA) at Kempinski Hotel in Accra on Saturday night. He takes over from Peace FM’s Kwami Sefa Kayi who won the award for the Year 2016. As a talk show host, Bernard Avle is one of the faces of a new kind of broadcaster who combines a strong grasp of social, economic and political issues, with a lively and fun presenting style. His background in Economics from the University of Ghana and an MBA from the Warwick University provides a context that strengthens his grasp of the business and economic issues, while his role as Director of News Programming at Citi FM, provides an important reference point as a manager and team leader, directly overseeing the work of over 30 broadcast and online journalists. Bernard is an ALIWA Fellow, an Edward R Murrow Fellow of Journalism and a Chevening Scholar. His ALIWA project, iJourno Africa involves unearthing and training African journalists in using data journalism tools to effectively tell African stories. Jamila Akweley Okertchiri of the Daily Guide newspaper was adjudged the Best Female Journalist for 2017. Apart from the journalists, some media houses were also awarded for showing excellence in their service delivery. They are the GCGL, Metro TV, GTV, Citi FM, Hello FM, Obonu, GNA, Moonlight FM and Kekeli Radio. The rest are Zaa FM, Radio Wa and the West End Radio. The GJA also conferred honorary awards on some personalities who have contributed immensely to the growth of the media industry. They are Mrs Barbara Gaisie, A.C. Ohene, Madam Faustina Nelson, Dr Osei Kwame Despite, Dr Ernest Ofori Sarpong, Dr Samuel Amo Tobbin, Dr Papa Kwesi Nduom, Mr Kwasi Twum and Commissioner of Police (COP), Dr George A. Dampare.